This phone is almost certainly not for you, but it could be the life-changing device you give your elderly relative for Christmas this year. 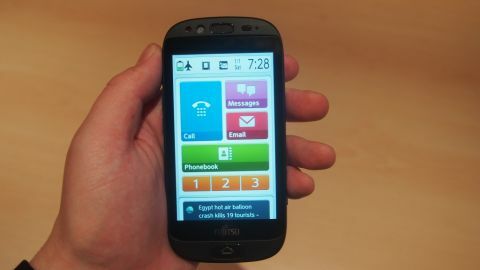 It's an Android device designed from the ground up to give older people the opportunity to use a smartphone without being bamboozled by complex operating systems and fiddly features. It's way more than a re-skin of Android though, as we'll see. The body has been designed to be easy to hold and hard to drop - the edges have a grippy feel to them. Android has been completely redesigned, with a far more basic user interface on one scrollable vertical pane. The idea is to make it impossible to get lost in the menu structure, and to make everything easy to find. Every sub-screen has a green question mark which gives guidance on how to use that page. This addresses the main problem that older people may encounter when buying a phone – featurephones are totally last decade but even budget Android handsets are tough to get to know if you're not technically inclined. They also tend to be small and fiddly, a nightmare for older people. This is a great way of making a touchscreen phone easier to use, and you can still install all the same apps that you could on any other ICS smartphone. To that end, the way the capacitive touchscreen responds to input has been completely changed. Instead of designing the phone to be as responsive as possible, Fujitsu has taken onboard the fact that older users are likely to go a bit slower. So instead of responding to the slightest touch, the capacitive screen behaves more akin to a resistive display, in that you need to actually push it to get a response. This does not apply when scrolling through menus, which is smooth as silk like any other decent smartphone. But when making screen selections and typing phone numbers etc, you have to actually push a bit harder, and the screen gives haptic feedback to let you know you've made a selection. If you're just gliding your finger across the screen, you're given a visual cue to show you which button will be activated when you press. When you set the phone up, you tell it how old you are and it customizes certain features accordingly. One of these funky customisations is to change the frequency range of the call so that it's easier to hear what's being said on the other end (as we age, we lose the ability to hear higher frequencies). The phone can even slow down the speech of the caller if you're talking to someone who speaks particularly quickly. The phone also has a personal alarm built into it, which when activated can sound an audio alert as well as automatically contact up to three people to let them know you're in trouble. In our brief test at MWC, we were really impressed. It's a great device and we can really see it having an impact on the lives of older people who need smartphone features without all the hassle of finding them. What's more, it's a good size - not too fiddly-small - and everything zips about quickly, without any lag. This phone is going on sale through Orange in France in the summer and should be launching in the UK soon after. It's unlikely to be a huge seller, but it's definitely a device we can see being used and loved by older people who want a fully featured phone that's made specifically for them. We certainly can't wait to give one to our grandaddy and see how he gets on with it.